Three years ago this month, Iran’s President Mahmoud Ahmadinejad famously told a New York audience that Iran doesn’t have any homosexuals. An aide later clarified that Ahmadinejad meant that Iran doesn’t have many homosexuals compared with America. Human rights groups say the Islamic republic continues to execute homosexuals. Gay and lesbian Iranians are increasingly among those fleeing the country. One young Iranian who fled to Turkey says he was targeted by authorities for two offenses: going public with his homosexuality and taking part in last year’s post-election anti-government protests. Ramin Haghjoo, 25, who is slender with a red streak in his long, curly hair, still laughs when he recalls the incident. His smile vanishes, however, when he talks about what it’s like to live as a gay man in Iran. In an Istanbul cafe, Haghjoo spoke of friends estranged from their families, living in fear and depression, wondering if their future holds prison or worse. Haghjoo went to Turkey in May, fully intending to return to Tehran and his family. But now he’s applying for asylum to the United States and says he can’t go back as long as the current government holds power. He says he would face arrest not just for his sexuality but for taking part in the protests that rocked Iran in 2009 after the elections, which were attacked as fraudulent, that returned Ahmadinejad to power. Despite a media blackout, Iranians managed to post on the Internet glimpses and sounds of their demonstrations and the brutal repression by pro-regime forces. Haghjoo says a week after the election, he and some friends took to the streets, and he remembers feeling excited and happy to see the crowds protesting the election results — right up until the moment he was shot. After finding the local hospitals swarming with security, Haghjoo says, he was driven to a private hospital far from the demonstrations, where they told the doctors he’d had a bicycle accident. While he was in the recovery room, he says, a man came up to him and asked questions. In a haze of sedatives, Haghjoo told him he’d been shot. When the doctor found out about the inquisitive visitor, he immediately signed Haghjoo’s release papers. Haghjoo says he escaped the notice of the security forces until this May, when he was visiting Turkey. 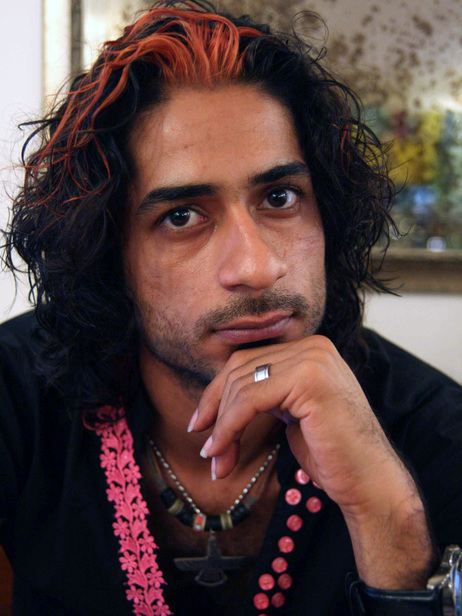 The previous fall he had agreed to be part of a friend’s documentary about Iran’s gay community and the opposition Green movement. While he was in Turkey, Voice of America interviewed him and broadcast a part of the documentary in which he talked about being shot during the protests, and about Ahmadinejad’s views on homosexuality. The next day, he was told, security forces raided his house in Tehran and took his father for questioning. Haghjoo went straight to the U.N. refugee agency and applied for asylum. “I realized I can never go back until the government changes — so I’m trying to find somewhere I can fight for the rights of Iranians,” Haghjoo says. He feels optimistic about his application to live in the U.S., but he doesn’t want to go without his partner Nima, an artist in Tehran. Thousands of young Iranians have fled either because of their sexuality or their political beliefs. Haghjoo has run afoul of the regime on both counts, and he wonders when he will draw his next breath in his homeland.